There were indications that President Muhammadu Buhari and the All Progressives Congress governors’ meeting at the Presidential Villa on Tuesday ended in deadlock as the two parties failed to make any decision on the tenure of the APC National Working Committee members. Why they kept mum after the meeting at the Presidential Villa? 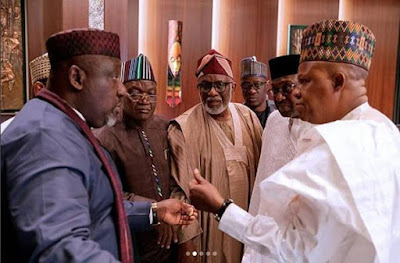 It was learnt that both the President and the governors later agreed that the committee set up by the National Chairman of the party, Chief John Odigie-Oyegun, on the issue earlier on Tuesday should be allowed to do its work and submit its report. The meeting which was held inside the Council Chambers started around 2.15pm and ended at 3.30pm. At the end of the meeting which sources described as stormy, the governors who were approached for comment told State House correspondents that they had resolved not to speak to journalists. Those who were approached included the Chairman of the Progressives Governors Forum, Rochas Okorocha; Plateau State Governor, Simon Lalong, and Kaduna State Governor, Nasir el-Rufai. Some other governors held their lips to express their non-readiness to speak to reporters. After the meeting reportedly ended in deadlock, it was also learnt that there was a sharp disagreement among the governors over the choice of date to reconvene. Before the meeting went into a closed door session, Buhari had nominated Lalong and the Kebbi State Governor, Atiku Bagudu, to say the opening prayers. All the APC state governors attended the meeting. The Vice-President Yemi Osinbajo and some top presidential aides and government officials also attended. Buhari, had, at the party’s NEC meeting on March 28, said the NWC members, who wanted to retain their positions, should resign and re-contest. He said it would be illegal to prolong the tenure of the NWC members or set up a caretaker committee. It was agreed at the meeting that the party should set up a committee that would advise it on the NWC members’ tenure. Odigie-Oyegun, at the party’s national secretariat on Tuesday, inaugurated a 10-member committee headed by Lalong to advise the APC on the issue. Apart from Lalong, other members of the committee inaugurated by Odigie-Oyegun are the Secretary to the Government of the Federation, Boss Mustapha; Governor Abiola Ajimobi (Oyo), Governor Rotimi Akeredolu (Ondo), Governor Nasir el-Rufai (Kaduna), Senator Ben Uwajomogu, Kabiru Ajana, Mr. Elisha Kurah (SAN), Mr. C.J.N. Dakas (SAN) and the National Legal Adviser of the party, Dr. Muiz Banire, who is also the secretary of the committee. Odigie-Oyegun said some of the issues that had been remitted to the committee for resolution were strongly legal, adding that the matter also impacted dramatically on political considerations. He said, “Therefore, your job is to bring these two together and advise us on the way we can implement our activities in the next few weeks and months in a way that is politically advantageous to our party, the APC, and at the same time with deference to the niceties of the law. “We must observe the law and at the same time emphasise that we try to do things that will be advantageous to the party. “We will furnish you with all the documents like the resolutions of NEC, the party’s constitution and the Nigerian constitution to help you do a good job. The Punch reports that the committee is expected to submit its report within four days.